The drop shot rig may be the best thing to happen to bass fishing since the spinnerbait. For anglers who love to fish light line, the drop shot set up is deadly. 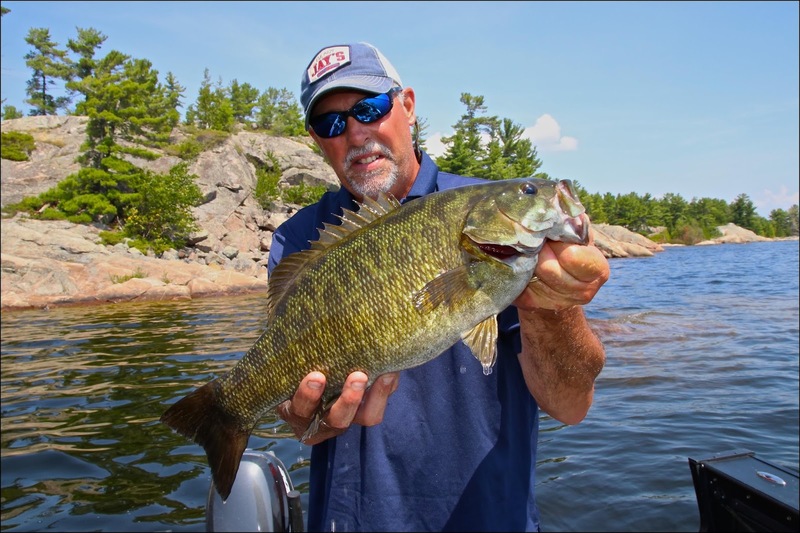 Recently on a trip to Waterfalls Lodge near Spanish, Ontario the Fishing 411 crew got the opportunity to fish drop shot rigs for both shallow and deep water smallmouth. We learned a trick or two from Bryan Darland, the store manager of Jay’s Sporting Goods in Clare. 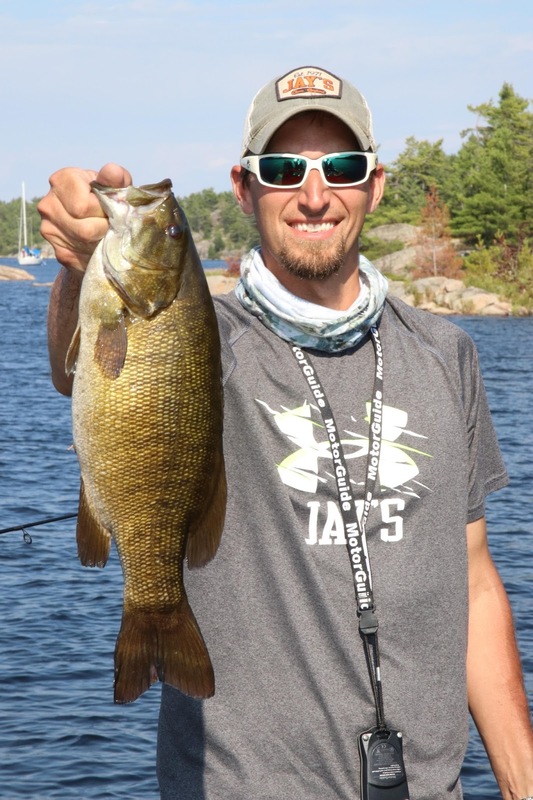 Bryan also happens to be a very talented fisherman and smallmouth are his favorite species. 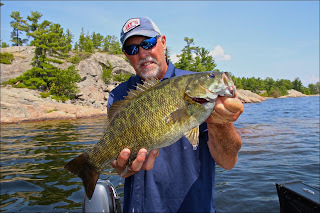 some world class smallmouth in Ontario. The first day on the water the folks at Waterfalls Lodge treated us to fishing one of their remote lakes only accessible by ATV. After about an hour long ride on a side by side and two quads, our crew pulled up to one of Ontario’s hidden gems. We loaded our portable sonar and fishing tackle into three small boats and set out to find some smallmouth. The first thing we noticed was the surface water temperature was 80 degrees! For northern Ontario water this warm is unheard of. Immediately Bryan started thinking we would have to look deep to find active smallmouth. We rigged up with 1/2 ounce drop shot rigs and tipped them with an assortment of split-tail minnows and three inch do-nothing style worms. The first place we tried was a small rocky island. Within casting distance the water depth ranged from about six feet to 25 feet. We simply motored slowly around the island keeping the boat in deep water and watching the sonar for fish. When we spotted fish it was a simple task to drop down on individual fish and catch them. This strategy worked so well we started calling it “see fish -- catch fish” because almost every smallmouth we marked was in a biting mood. 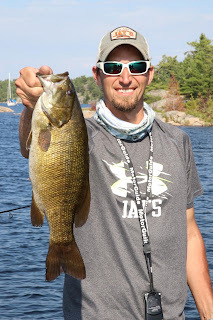 The deep water theme held up all day and we boated countless smallmouth in the 1.5 to 2.5 pound range on drop shot rigs. The next day we loaded our bass gear into the Fishing 411 film boats, a pair of identically rigged Starcraft STX 2050 multi-species aluminum boats. Our destination was a place called the Whaleback Region of Lake Huron. We launched at the Spanish, Ontario public access and motored about 20 minutes west to a cluster of islands not far from where the Whaleback Channel empties into Lake Huron. The Lake Huron influence kept the water temperatures here a little cooler, but the surface temperatures were still in the upper 70’s. It took several hours to develop a pattern, but late in the day we came to the conclusion that most of the bass were holding in small patches of cabbage weed adjacent to good rock structure. Not only do cabbage weeds provide bass cover and shade, they also release oxygen into the water a bonus when fishing in warm water conditions. Again the drop shot rig shined as the best way to penetrate the weeds. We casted into openings in the weed growth, reeled up the slack line and simply vibrated the rod tip to give the plastic a little action. filming of an episode of Fishing 411 TV. The drop shot rig is versatile enough that it can be fished in both shallow and deep water situations. By simply switching out the plastics used an angler can give bass a lot of options to consider. Some of the most popular plastics include split tail minnows, do-nothing worms, small flukes, three inch worms, tubes, beavertail grubs and hula grubs all work well on a drop shot rig. We spooled up using 10 pound test Maxima Braid 8 as our main line and tied our drop shot rigs to 10 pound test Maxima Ultra Green Leader Material. A No. 2 drop shot hook is tied to the Ultra Green leader using a palomar knot. Remember to run the tag end back through the hook eye so the hook is positioned at a 90 degree angle to the leader. Also it’s important to leave about 12 inches of tag line when tying the palomar to attach to the drop shot weight. The other (longer) end of the leader is double uni knotted to the braid. This set up allows the drop shot leader to be reeled right up into the rod guides for safer and better casting accuracy. Anglers have a number of options when it comes to drop shot sinkers. We opted for pencil style weights because they don’t hang up in rocks as much as the ball or bell shaped weights. The other advantage of the pencil style drop shot weight is they can easily be trimmed to lighten the weight if necessary. Whaleback region of Lake Huron. to world class fishing all summer long. Smaller sizes of the pencil weights are available, but I generally buy 1/2 ounce size weights and trim them as necessary for fishing shallow water. Anglers who don’t want to tie up their own drop shot rigs using the palomar knot can purchase drop shot hooks pre-rigged with a swivel above and below the hook. This makes it easy to tie on the necessary leader and dropper lines. The Spanish, Ontario region is part of the Algoma Country Tourist Bureau and is located about two hours east of Sault Ste Marie, Ontario along Highway 17. We stayed at Waterfalls Lodge (www.waterfallslodge.com) a full service fishing camp right in the middle of Ontario’s top smallmouth waters. 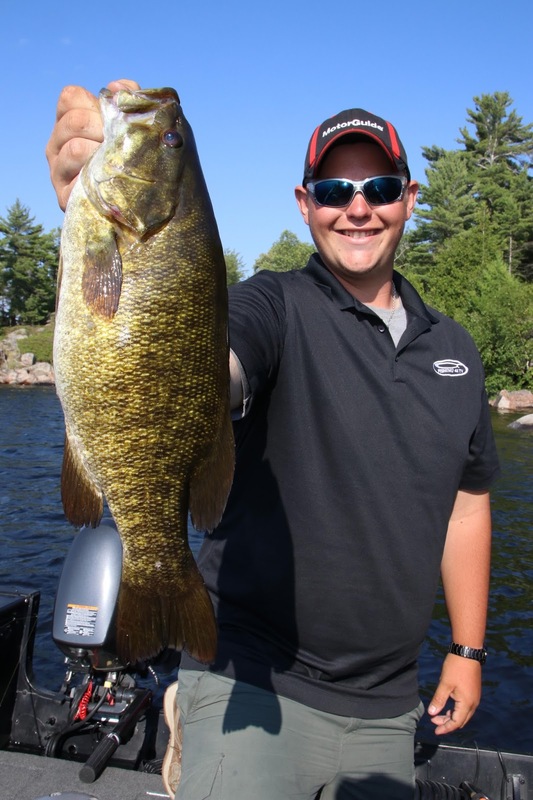 Waterfalls Lodge is located on a chain of four lakes rich in smallmouth bass and walleye fishing opportunities. Each cabin is provided a 16 foot Starcraft boat complete with sonar, electric motor, electric start outboard and aerated livewell. Anglers who want to fish the Whaleback region of Lake Huron will need to bring their own boat.